A personal version of the Guild Events Improved mod which has been abandoned to my knowledge. 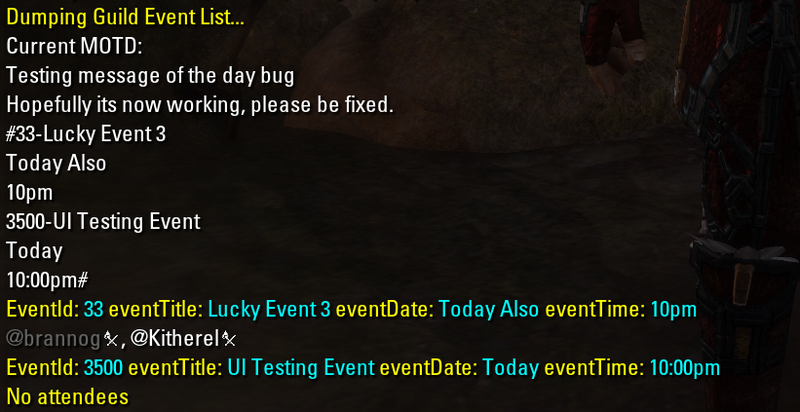 My alterations to this mod, are to simply write the existing MOTD, event and attendees to the chat window just prior to updating it. Guild mates have experienced a bug where adding an even can cause all the event data to be lost and therefore this was added as a safety measure. Please treat this as beta should you decide to download it. In testing I found that adding an eventID which is not a number would result in the loss of roster member notes so sure to use numerical eventId's only. If anyone has a useful bug capture from an occurrence of losing event data when creating a new one, please post it in the comments and i'll take a look.